« I can now go anywhere…. RN has partnered with KnH of Germany which supports the implementation of a very well established Self-Help method called the Self Help Group. This approach has many similarities with the main RN approach, but puts more emphasis on the children, through working with the poorest of the women and gives them opportunities to improve their lives by borrowing money from their own “village banks” (save and borrow). They use the borrowed money to start business and many women are doing fine and are now able to sustain their lives and families. At the end of the month the loan will be paid back with an interest of 10%. Since its introduction the approach has been instrumental in creating positive change in lives of communities in Kazungula District. Kamusima Self Help Group was formed on 16th August 2010 with 20 members. The group meets weekly on Wednesday at 1400 hours, and during their weekly activities, saving is one of the major activities group members do not forget to do. Their membership fee was K10.00 and they started with K0.50 as their saving. The group is strong enough to function on its own without the supervision of the Community facilitator. So far their group capital has risen to K3, 371.50. 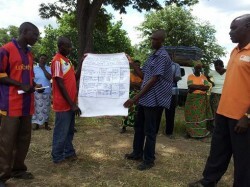 Atuchibweze SHG started on 16th June 2012 had a membership of 21 when the group was formed. The group now is strong enough to function on its own and it is one of the eight SHGs which have come together to form Twanjila Cluster Level Association in Matengu area. Their group capital was at K2, 983.00 at the time the visitors visited the area.